Hello friends, it’s Tejae from Tejae’s Art. 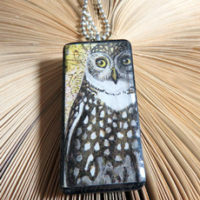 I’m a mixed media and polymer clay artist. 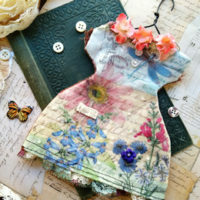 Today I’m excited to show you my first Mixed Media Design Team project for The Graphics Fairy. As I was exploring The Graphics Fairy’s Premium Membership site and going through all the lovely printables, I came across the Vintage Roses and Bees collection. It reminded me of my flower beds, summer gardening, and sending artsy postcards to friends. It is the perfect inspiration for this project. 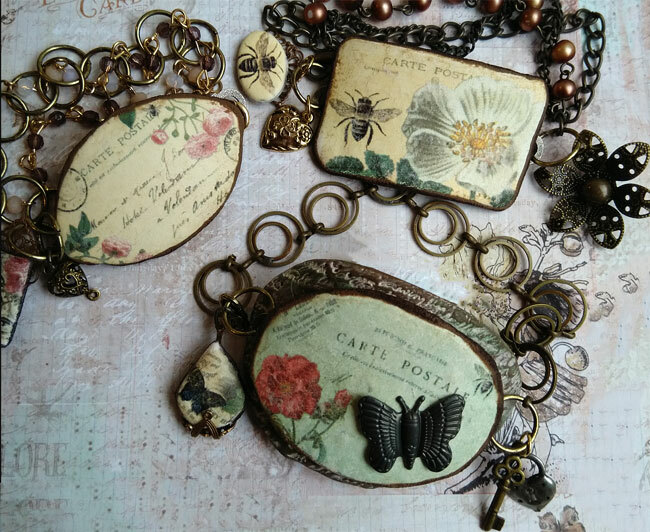 I used the vintage postcard images for the main elements and smaller roses, along with bees and butterfly images to make smaller dangling polymer clay charms. Let’s look at each bracelet in detail. 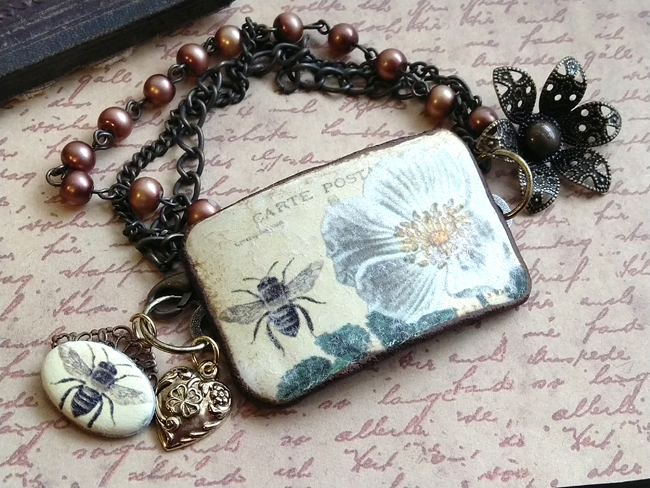 The bee bracelet features a rectangular shaped polymer clay element using the vintage postcard with a bee and white flower transferred image. There is a small bee image transferred onto polymer clay and attached to a metal finding that dangles from the side. Additionally, I attached a metal heart charm, round copper beads, a variety of vintage colored chains, and metal findings, including a metal flower. I transferred the gorgeous rose with the green colored background postcard imagery onto polymer clay. I cut it into an oval shape. After I put the bracelet together I felt like it was missing something. I decided to add a metal butterfly and layer something behind the big pendant to add depth and interest. The brown clay was impressed with a handwritten text stamp, then white washed with a lighter paint and touches of green. The heart and key charms reflect my secret passion for gardening. The small teardrop shaped charm is another image from the Bee and Roses collection transferred to polymer clay and attached to a metal finding. The antiqued double chain coordinates perfectly. This vintage postcard collage image has tiny roses and handwritten text. I transferred it onto polymer clay. It was then cut into a marquise shape. 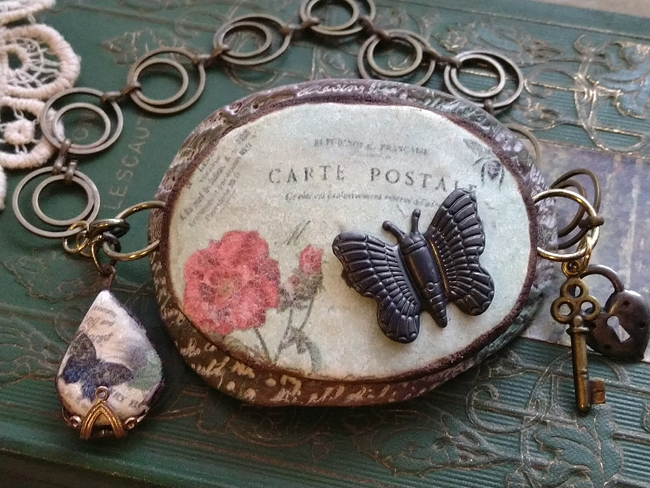 A rectangular shaped image, transferred to polymer clay, became the rose and butterfly tag. It also includes a tiny metal heart plus an assortment of beads and vintage chains. I began this project by shrinking down the postcard, bees, roses and tag images in my photo editing software. Then I flipped (reversed) the images and printed them out on my laser printer. I conditioned a light colored polymer clay and transferred the images. Polymer clay is such a versatile medium that it can be made to look like almost anything. I’ve been ‘claying’ for over a decade. I never tire of it because the possibilities are endless. It’s been my pleasure to share this project with you this month. I love using vintage images in my projects and The Graphics Fairy Premium membership has some of the best images available. Please watch my video on The Graphics Fairy YouTube channel where I share a couple of more secrets with you. 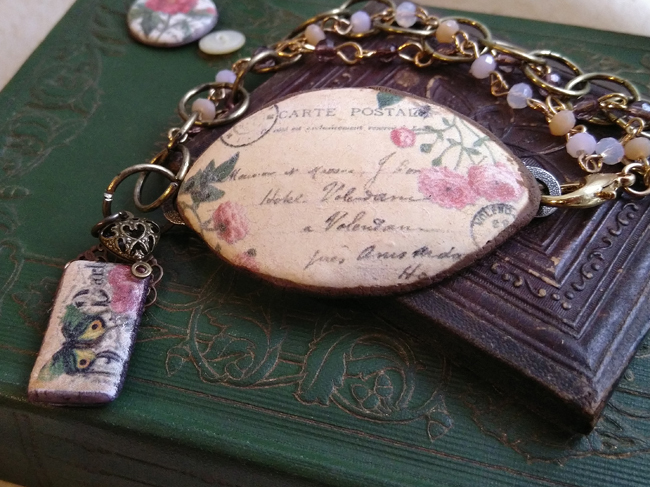 I hope you’re inspired by the Vintage Postcard Mixed Media Bracelets and will share your creations with us. I look forward to creating with you again next month. Please visit me at Tejae’s Art and on Instagram. These are so awesome. I can’t pick a favorite. Thanks, Tejae, for a wonderful inspiration. Thank you Leslie ❤️. I hope you try it too. I love these so much Tejae. I wish I could make jewelry. My fingers do not do the findings very well!! What beautiful inspiration! When you make a collage for the centerpiece, do you cut and attach the pieces individually or do you make a digital collage and print it as one piece? 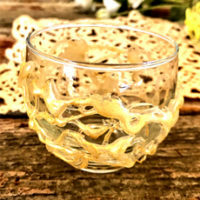 I can’t wait to start making my own gorgeous pieces using this method. Thanks Kathleen, you can do either, have fun! Just Beautiful. What a wonderful way to use the many different graphics available to make a special something. Love to see more ways to use this technique. Fun, diverse, & affordable. Thanks so much Luan, have fun creating!